Two people have been stabbed to death in London in separate attacks within 40 minutes of one another. 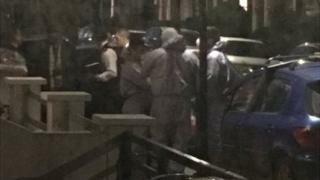 A man thought to be in his 20s died in hospital after being attacked in Colindale, north-west London, while a woman in her 30s died at the scene of a stabbing in Brixton, south London. An 18-year-old man is in a critical condition after a third separate stabbing three hours later, on Sunday. More than 35 people have been stabbed to death in the capital so far in 2018. A woman in her 20s has been arrested in connection with the Colindale attack. Police said they were called at 17:58 BST on Sunday to Zenith Close and found a man with stab wounds. He died in hospital later that evening. Police said the victim and suspect were believed to have been known to one another. A man in his 20s has been arrested on suspicion of murder over the Brixton death. At 18:36 BST officers were called to a home in Sudbourne Road, where a woman in her 30s had been attacked. She was pronounced dead at the scene. Her next-of-kin have been informed, police said. In the separate attack near Alexandra Palace, Haringey, a 19-year-old man w as arrested near to the scene and taken into custody at a north London police station.